Barely three decades after Wilbur and Orville Wright made the first flight where their eponymous Flyer took off and landed under its own power, aeroplanes were still a mystery to most of the public. Some probably still thought it was witchcraft or some other evil influence holding man and craft aloft. Movies of the era were filled with airplanes and the daring young men who piloted them for war, for recreation, and for profit. 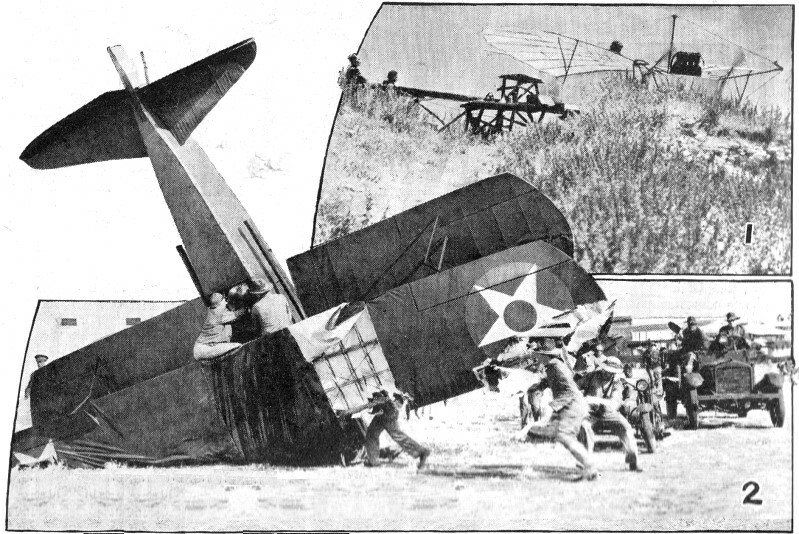 This report from a 1938 edition of Boys' Life is evidence of just how ubiquitous flying machines were in films. Big-name actors like Lionel Barrymore, Basil Rathbone, Fred Astaire, and Ginger Rogers added to the excitement. The latest air thriller, Men With Wings (Paramount) in every way justifies its use of so daring a title. Here is something far more than terrific sound of roaring engines and sight of dazzling flying stunts. For here, on the screen, the epic history of the airplane unfolds. It is like a magnificent panorama, scene upon scene, save that what you see is not a vast canvas displayed, seemingly endless, but a picture moving, ever moving, ever more marvelous as men flying ever faster, ever farther, ever higher, make conquest of the skyways of the air. Nor is this all! Across these vivid scenes, like a shuttle moving on a loom, a colorful drama is being woven. To the art of the motion picture camera, portraying so completely the marvelous development of aviation, is added the art of the story teller, of the dramatist and actor. Slowly developing, following carefully a pattern, a story emerges making fascinatingly clear not only what a man can do with an airplane, spreading his wings, but also what an airplane does to a man - the man who gets flying in his blood - the man who becomes so inflamed by the spirit of adventure that he is really only happy when somewhere, near or far, he is daring death to do its worst. This character, so reckless yet so likable, is splendidly portrayed by Fred MacMurray, supported by others who with like ability contribute to the dramatic action that is as alluringly interesting as the breathless story of men risking their lives to conquer the boundless ocean of the air. But no matter how great the disaster or how often death took its terrible toll, ever the word was onward until at last there emerged a familiar figure (3) by the whole world acclaimed. Not the least part of this development was the use of the airplane in the World War. Here, once again, it is well to pause and emphasize that this amazing drama of the skyways is not all thrills. 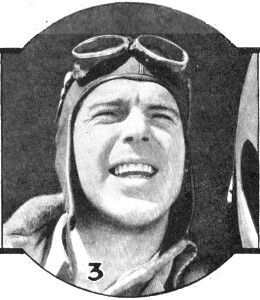 For, like a minor melody in music, supporting the main theme, finally emerges significantly in the grand climax, so in Men With Wings does another colorful character, vastly different than the reckless adventurer gradually appear, at the end, making unmistakably clear that the type of aviator possessed by the inner urge for action is being replaced by the more deliberate type - the careful planner, the man who goes ahead only when he is sure that he is right - right so far as the last word in aviation is concerned. It is this idea of the right way that climaxes the thrilling story of the daring pioneers in aviation; this idea become the ideal that the true meaning of man's conquest of the air is that men and nations the whole earth over may be brought ever closer together until, at last, passing through limitless time to his highest destiny, man comes to the dawn of another day of. even greater conquest, a day when there will be no more East or West but one great world brotherhood. There are other movies well worth listing, all of them good entertainment because the featured players sustain their reputation for the kind of characterization that has made them famous: Lionel Barrymore and Jean Arthur in You Can't Take it With You (Columbia); Ronald Coleman and Basil Rathbone in If I Were King (Paramount); Fred Astaire and Ginger Rogers in Carefree (RKO); Bobby Breen and Charles Ruggles in Breaking the Ice (RKO); Jane Withers in Keep Smiling (20th Century Fox) . The below pictures are not listed in order of excellence but presented as a group from which our readers may make selection according to their various tastes. Keep this list to check with your local theater as to when the pictures will appear. However, in the way of a movie made-to-order for boys, our recommendation is, if there must be a one and only choice, make it Men With Wings. In savage combat (4) men in great numbers as never before learned how to use their wings. At the close of the awful fratricidal strife, returned to civil life, some of them became airmail pilots, others, as great adventurers in the air set the pace for daring flights (5) over land and sea; still others became pilots of passenger airlines. At last there emerged a giant plane with widespread wings (6) to transport passengers over sea as well as land. 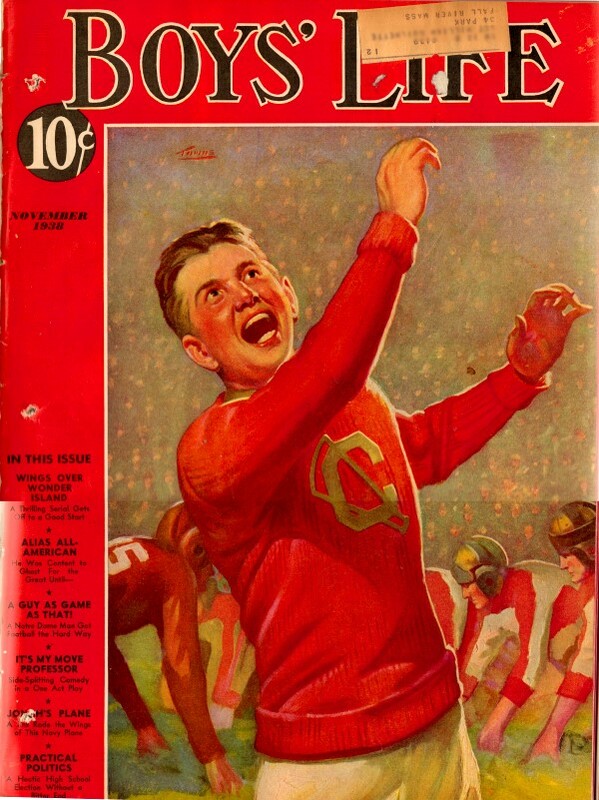 The film is the first of its kind in color.